The End of the Year Wrap-Up! As 2010 comes to an end, I would like to thank all of my readers for their continued support! Ms. Celiac Says would be nothing without you! Tomorrow will be our 2nd Year Anniversary since starting this site on January 1st, 2009. To celebrate, Ms. Celiac's Shop is having a MAJOR SALE starting today and lasting throughout the month of January! Ms. Celiac's Shop is a place where you can buy products to display your gluten free pride in a fun, thought-provoking way! We are currently selling 10 different shirts and 1 tote bag! All items are priced below $20! However, I will still be writing on this site with articles geared to my local NYC readers and my national and international visitors! This year has been great for those of us with Celiac Disease as more companies and restaurants are starting to cater to a gluten free audience! Snyder's of Hanover released gluten free pretzels, General Mills released a gluten free Bisquick Pancake and Baking Mix, and now Post Foods are certifying their Fruity and Cocoa Pebbles gluten free! We can't wait to see what 2011 has in store for us! And you know you can always count on Ms. Celiac Says to bring you the latest and greatest in gluten free events, news, products, and restaurants! *What would YOU like to see featured on Ms. Celiac Says in 2011? Let us know by sending an email to MsCeliacSays@gmail.com! Make sure to enjoy some delicious gluten free cookies throughout the season! Depending on the content, some of the articles that I write for Examiner.com will also be posted on Ms. Celiac Says and some of the articles will be specific to one site or the other. Make sure to check out both sites! To have my latest articles emailed to you from Examiner.com, visit my Examiner page and click "subscribe." As always, if you have any questions, comments, ideas, or tips, feel free to email me at MsCeliacSays@gmail.com. I hope everyone is enjoying the holiday season! Holiday Baking + Contest Winner! So, it is time to announce the winner of the Katz Gluten Free Contest. Janice Wei of Buena Park, California will be receiving a sample pack of tasty treats from Katz Gluten Free. Congratulations!!! This week, I've started my holiday baking. So far, I have made gluten free 7 Layer Bars, Icing Cookies, Chocolate Balls and Chocolate Layer Bars. I am currently in the process of making gluten free Gingerbread Cookies for the first time ever - I will let you know how they turn out! 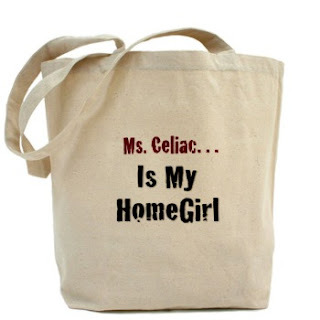 If you haven't yet, make sure to follow Ms. Celiac on Twitter or "like" us on Facebook! 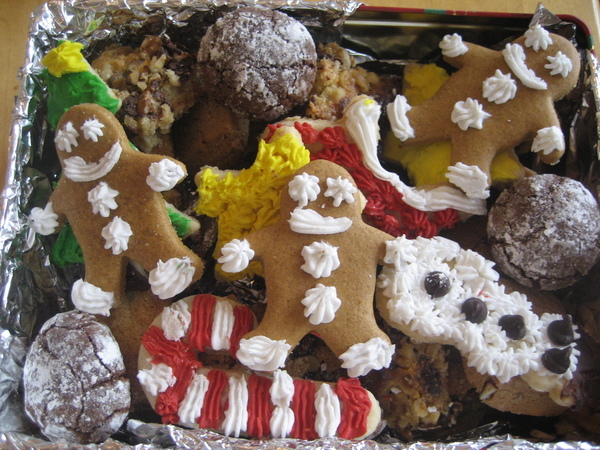 Ok, time to get back to the Gingerbread Men! Shabtai Gourmet Wins at KosherFest 2010!!! For the fourth time, Shabtai Gourmet has won the 1st Place Award for Best New Kosher for Passover Dessert at Kosherfest's annual New Product Competition. This year they were chosen as the winner for their delicious new treat, Gluten Free Yidels. These Yidels are Devils Food Mini Chocolate Swiss Rolls and are amazingly delicious! Shabtai Gourmet has long been one of my favorite gluten free brands! In addition to their products being gluten free they are also dairy free, peanut free, casein free, soy free, lactose free, corn free and certified Kosher and certified Kosher for Passover! They are also baked in a dedicated facility! Many of their products also contain no hydrogenated oils, no trans fats, no artificial colors or flavors, no preservatives, and use all natural and organic ingredients! You can find Shabtai Gourmet products at health food stores and supermarkets and Bloomingdales' (select Eastern locations) all year round! You may also purchase them online at www.shabtai-gourmet.com. Shabtai Gourmet ships across the United States and to Puerto Rico. For more information, follow them on Twitter or "like" them on Facebook or visit their website at www.shabtai-gourmet.com! Katz Gluten Free - New Products + Giveaway! I was lucky enough to be sent some delicious new products from Katz Gluten Free this week! I received both the Vanilla Rugelach and the Chocolate Frosted Cupcakes! I had previously tried both their Chocolate Rugelach and their Cinnamon Rugelach (both favorites of mine) and this new variety was equally as good! It is more of a lighter flavor but still rather tasty! I've always thought that Chocolate + Rainbow Sprinkles are the perfect combination and Katz's new Chocolate Frosted Cupcakes are no exception! Once you bite into them, you will not be able to put them down! In addition to these two new products, Katz Gluten Free has many delicious items that are perfect to serve to guests throughout the holiday season! And during this time, there will be free shipping on all orders over $30! Also, by visiting Katz's website you can request a Free Sample Pack (shipping applies under $30). 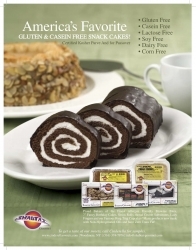 Thanks to Katz Gluten Free, one of our readers will be receiving a Free Sample Kit! To enter this contest, please send us an email at MsCeliacSays@gmail.com with "Katz Gluten Free Giveaway" in the subject line and your name and address in the body. Entries will be accepted until December 15th! To enter the Grand Raffle, where the winner will receive a huge box containing one of each and every product Katz makes, visit their website at Katz Gluten Free to enter. The drawing for this raffle will be on January 3rd, 2011! For more information check out their Facebook Page, Twitter Page, or Website! I was recently sent a box of Sof'ella's Gourmet Gluten Free Chocolate Cake Mix to sample. I chose to make some chocolate cupcakes! These cupcakes turned out to be very moist and still stay together. Even those not on a gluten free diet enjoyed their dark chocolate flavor! The cupcakes were rather easy to make - all that needed to be added were butter, eggs, and water! I used Betty Crocker's chocolate frosting to top them off! In addition to Sof'ella's Gourmet Gluten Free Chocolate Cake Mix they also sell a Gourmet Gluten Free All Purpose Baking Mix! Both items are available on their website at www.sofellafoods.com!